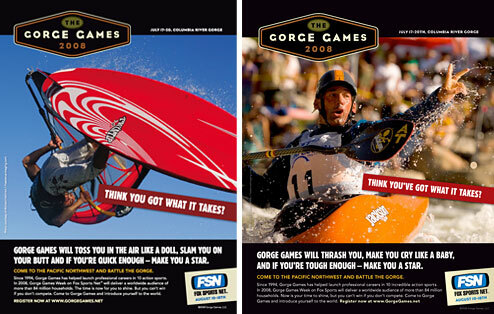 The Gorge Games, which began in 1994, attracted world-class athletes to the Columbia River Gorge to compete in events like windsurfing, kiteboarding, mountain biking, adventure racing and much more. The games hoped to open the world to adventure. One of my close friends helped put on the adventure race, and I was hoping the Games would propel the sport. With TV coverage on FOX and big sponsors it was quite an event. Perhaps due to the economy, the Games were not held in 2009. Just as we hope Eco-Challenge will be back, we hope The Gorge Games will be back one day. There are other places you can do wind events, land events or water events, but this is one of the few places on Earth where you can do all that in one location, said Joshua Ryan, CEO of the Games. The games were held in Hood River, OR, near the Columbia River Gorge. There were 20,000 spectators and $100,000 in prizes up for grabs. The events were all very extreme except for the running events, with the longest being a half-marathon. The adventure race was run by an adventure racing company out of Oregon which puts on many local events. It was a 24 hour event and it was done wonderfully. This group is a stellar group and the event went down as a great one. 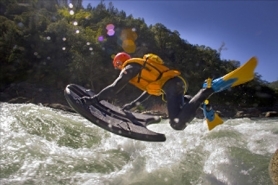 There was River boarding with class 4 and 5 rapids with 15- to 20-foot drops. Kayaking also took place on the river with big white water. There were 36 launch sites for windsurfing, and kiteboarding. There was 3600 feet of climbing on the mountain bike trail. Now that is some climbing! It has a narrow trail with large rocks. The trail ranked in the top 3 in the US. In the air there was Windsurfing and Kiteboarding. Of course Skateboarding was a popular event amongst the younger ones. And speaking of younger ones this event was made for children as well. The cool part about these games is children could go and learn! There was BMX riding, catamaran sailing, kayaking, kiteboarding, mountain biking, sailing, skateboarding and windsurfing from seasoned veterans from their respected sports. 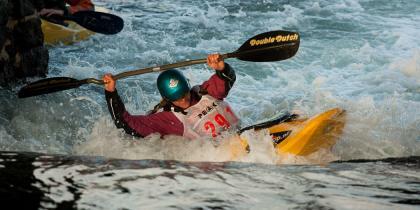 There was speculation that the Gorge Games were not grass roots enough and relied heavily on sponsorship. When the economy fell so did sponsorships. The Games couldn't be sustained, at least for now. Josh Galt the Water Director for Primal Quest said it's a bummer... referring to how the Games were hoping to propel river boarding to new heights. No one has the answer as to when will the Gorge Games return. I know after 10 years,we still hold out for Eco-Challenge, so maybe just maybe they'll make it back, and propel these extreme sports back in the lime light.